In 1929, less than 30 days after Black Tuesday and the beginning of the stock market crash, the Nashville Herald was running stories to bolster the local Berrien County, GA economy. 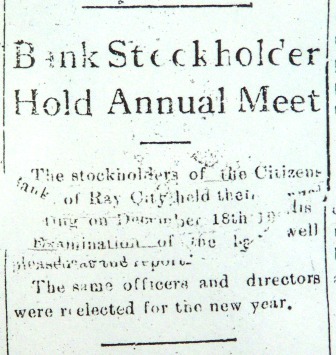 The Ray City “booster” story assured readers that the bank in Ray City was financially strong, and that trade was brisk among the businesses of the town. In keeping with the policy of the Herald to boost and build up all sections of Berrien County, Mr. A.W. Starling and myself spent Monday afternoon in the interest of a Ray City Community page which appears in another section of this edition. Upon our arrival, which was the first stop we had ever made in this enterprising town, we were greeted by our old friend, Mr. C.H. Winderweedle, of the firm of Johnson and Winderweedle, who do a general mercantile business and carry in connection a high grade line of groceries. Mr. Winderweedle showed us every consideration and was one of the first of the business men of the community to sign up for one of the spaces in the booster page. He was quite a bit more optimistic than some of th merchants called upon and stated that although his was a new firm that he was well pleased with their beginning and intimated that with the bargains they were offering that the and his partner anticipated a continued growth in trade. Our next stop was made at the Citizens Bank of Ray City, where we had the pleasure of meeting Mr. John D. Luke, the popular and efficient cashier of the institution. Mr. Luke is a man of very pleasing personality and during our short conversation we can very easily understand why the banking institution of which he is the head has prospered as it has. As we understand it the Citizens Bank of Ray City is one of the strongest financial institutions in the county and its business is growing steadily as will be shown by the last financial statement as called for by the superintendent of state banks. It has total resources of over $150,000, and deposits of over $100,000 and shows that it has no notes and bills rediscounted. Berrien county is justly proud of its banking institutions and conservative business men do not hesitate to place the Citizens Bank of Ray City along with the head of list. We casually visited the firm of Swindle and Clements and were surprised to find the class of merchandise that a large force of clerks were busy dispensing to a large number of customers who were continually pouring in and out of the store. In fact their rush was so great that it was several minutes before we could interview Mr. Clements, and when we did he readily agreed with our proposition to assist in boosting the county and he and Mr. Swindle readily signed up for one of the ads on the Ray City Booster Page. While in his store we were what might be termed a “victim of circumstance” insamuch as we spied a string of jack fish, which were so near uniform size that we became attracted to them and after getting their weight, bought the six pound string for the insignificant sum of 90 cents. Mr. Clements stated that his firm always has a supply of these fresh water fish on hand, which are alive when brought to his store, and supplies the lovers of the finny tribe with fresh oysters at all times in season. Their meat market which is operated in connection with the store is modern in every detail and is equipped with Frigidaire cold storage apparatus, insuring their patrons of always receiving the most sanitary meats. Upon a trip of this nature it is natural for one to become fatigued and need refreshing so we made a call upon the C.O. Terry Drug Store, the proprietor of which is familiarly known as “The Accommodating Druggist.” Dr. Terry, himself waited upon us and true to his slogan proved to be very accommodating. Being a very busy man dispensing cold drinks, filling prescriptions and waiting upon the trade in general, we did not get to spend as much time with him as we would have like, but a careful survey of the store convinced us that he was modern in his ideas and carried a choice line of drugs as well as druggists sundries. Another noticeable feature was a large sign across the rear end of the store reading “Sargon” which is evidence enough within itself to show that he is the leading druggist of his section. Just before taking leave of the little city it was our pleasure to visit the garden of Mrs. J.H.P. Johnson, which is a marvel, especially considering the dry weather. Our observation of the garden and surroundings, convinced us that there is no danger of the family going hungry unless they should suddenly become too weak to pull up vegetables, milk a cow, kill a chicken, or clean a hog, as there was plenty of evidence that this family believes in living at home. Hosea “Hod” P. Clements and his wife, Alma, lived in a house on Jones Street, Ray City, GA, where they raised their daughters, Mildred and Frances. 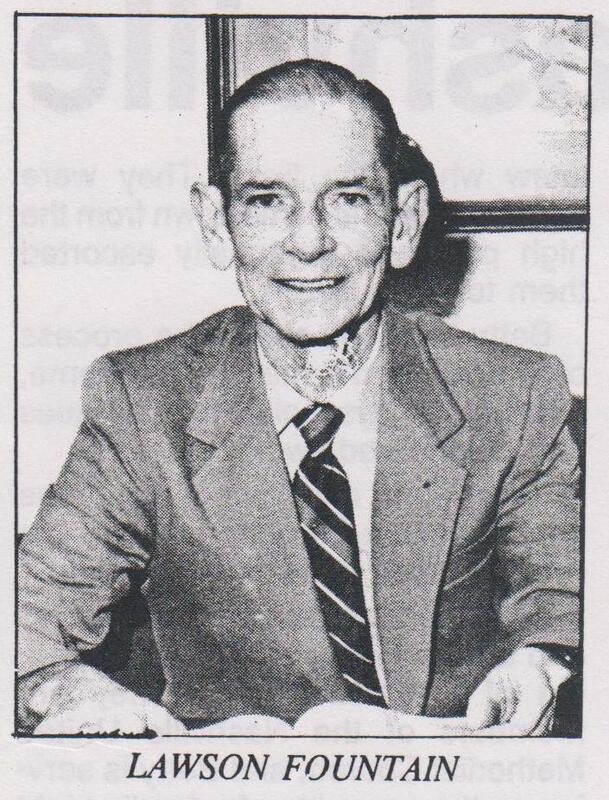 According to a 1973 Valdosta Times interview, Hod Clements was born in 1890 in Milltown (now Lakeland), GA and moved to Ray City in the 1920s. 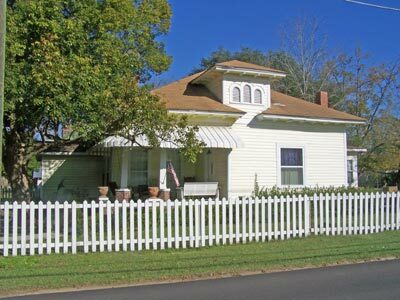 Home on Jones Street, Ray City, GA was the residence of Alma and Hosea “Hod” Peoples Clements. Armed with a degree from the Georgia Normal College and Business Institute, Hod Clements went into business in Ray City. In 1948, buying the old Ray City Bank and its equipment for $3,500 he began banking with a capital of $10,000. 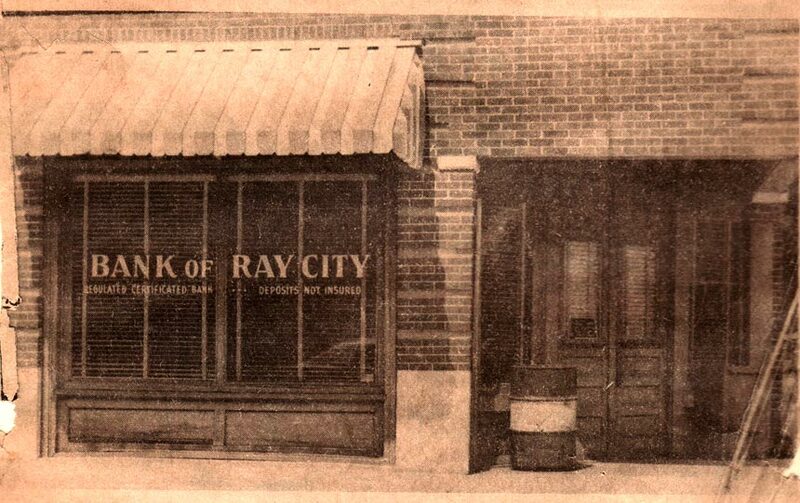 The original Ray City Bank was begun by his uncle Jim Swindle who organized it around 1908. 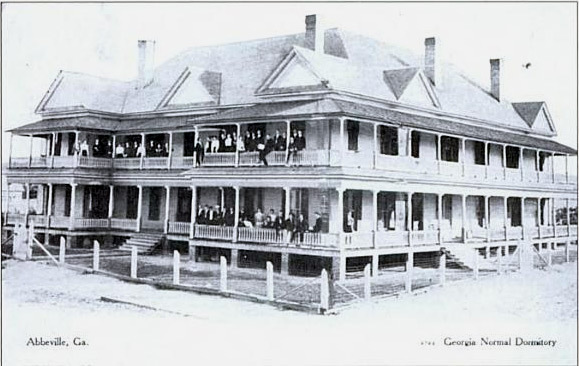 When students in Ray’s Mill, GA sought educational opportunities beyond the common schools of the area, Georgia Normal College and Business Institute at Abbeville, Georgia was one option. 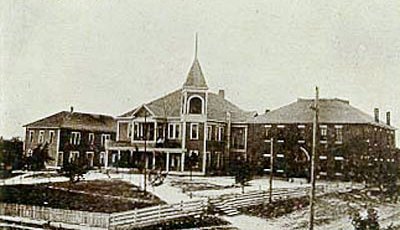 In 1902 cousins Lucius Jordan Clements and Bessie Clements graduated from the Institute. L.J. Clements went on to manage the operation of his family’s business, Clements Sawmill at Ray City. His younger brother, William Grover Clements, also completed studies at the college and returned to Berrien County to become a teacher. Another Clements cousin who attended the institute in 1911, Hod P. Clements, later founded the Bank of Ray City. Canceled checks drawn on the Citizens Bank of Ray City, Ray City, GA document some of the local businesses that Effie Guthrie Knight transacted with during 1927. 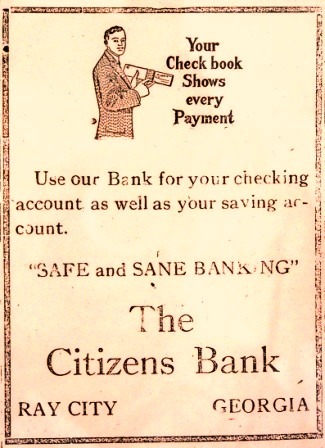 1927 check drawn on the Citizens Bank of Ray City and made payable to Dr. Folsom. As the check above shows, Dr. George Hill Folsom came to Berrien County, GA some time prior to 1927. He established his home in Ray City where he engaged in general practice. A check in the amount of $1.00 might have been typical payment for an office visit in that time. 1927 check written by Effie Knight to C.O. Terry, and drawn on the Citizens Bank of Ray City. Written the same day as the previous check, this check to Ray City pharmacist, C. O. Terry, may have been to fill a prescription written by Dr. George Hill Folsom. Another check written by Effie Knight is made out to G.M. Purvis. Guy Marvin Purvis owned a general merchandise store in Ray City, GA. Furthermore, he was Effie’s brother-in-law so naturally she’d be inclined to do business there. A check made out July 5, 1927 to G.V. Hardie in the amount of twelve dollars and seventy cents, and drawn on the account of Effie Knight at The Citizens Bank of Ray City. In the 1920s, Gordon Vancie Hardie opened up the first gas station in Ray City, GA. The check above may have been payment for service on Effie Knight’s car. Lawson Fountain of Ray City, GA.
Lawson Fountain grew up in Ray City, GA and was educated in the Ray City School. 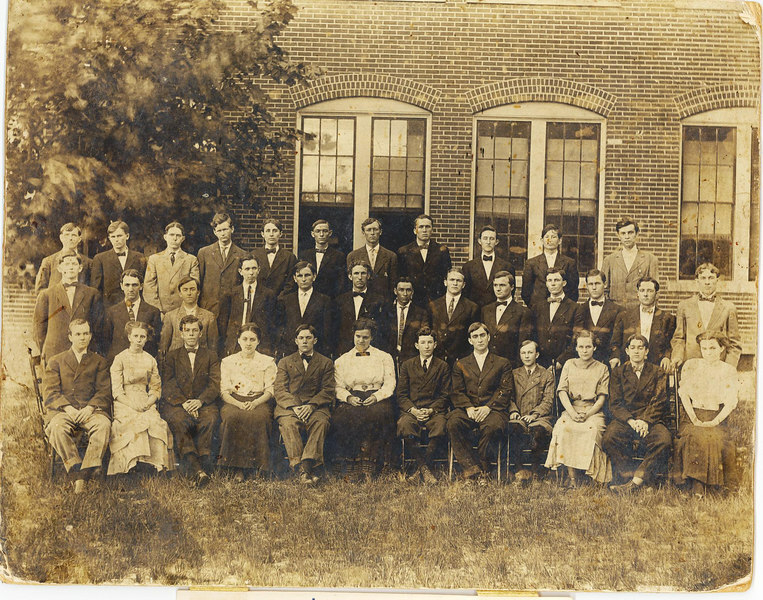 He graduated with the Class of 1939 and later married his high school classmate, Mildred Clements. 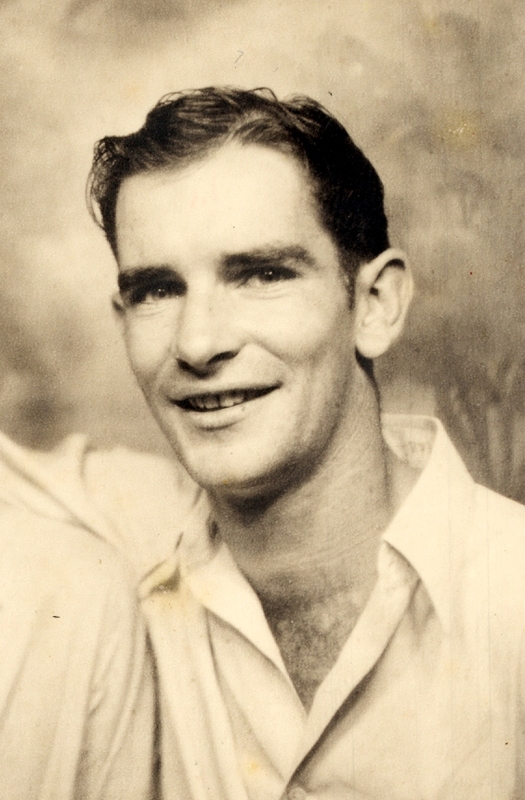 In 1949, Lawson’s father-in-law, H.P. 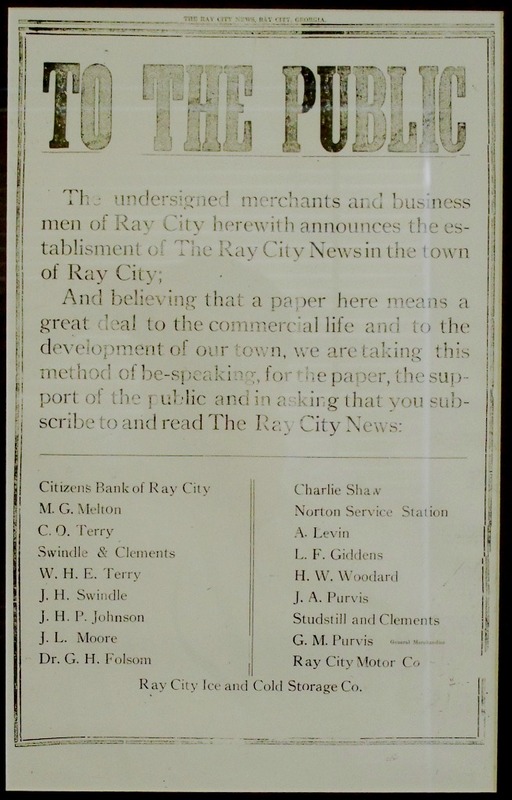 Clements, opened a bank and named it the Bank of Ray City. Mr. Hod P. Clements and Lawson Fountain operated the state chartered bank until Mr. Clements was forced to retire due to ill health. Then Lawson Fountain served as President of the bank. His home was on the east side of town. 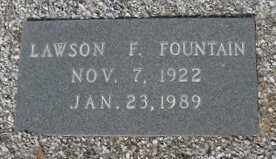 In 1959, Lawson Fountain served on the City Council of Ray City. 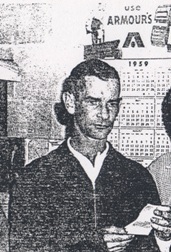 Lawson Fountain returned from Jacksonville, Florida to his hometown in 1956 and helped start the Bank of Ray City. He continued his banking career with the Citizens Bank after it purchased The Bank of Ray City. Lawson is married to the former Mildred Clements, and they both grew up in Ray City. Their only son, James, now lives in Oregon. Fishing is Lawson’s favorite pastime, and he said he enjoys the many good fishing places around Ray City. The Fountains are active in Ray City United Methodist Church. Lawson Fountain’s knowledge of the people and their needs in the Ray City area adds a personal touch to banking at the Bank of Ray City Office of the Citizens Bank. 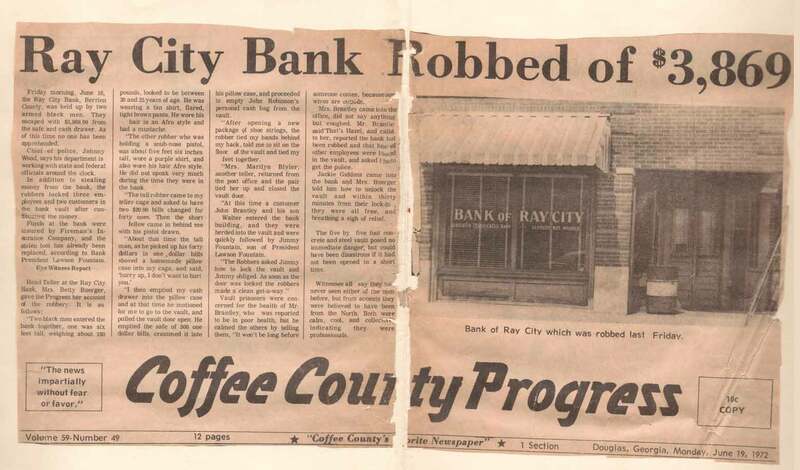 In 1972 the headline news in the Ray City, GA area was the robbery of the Ray City Bank. Friday morning, June 16, the Ray City Bank, Berrien County, was held up by two armed black men. They escaped with $3869.90 from the safe and cash drawer. As of this time no one has been apprehended. Chief of police, Johnny Wood, says his department is working with state and federal officials around the clock. In addition to stealing money from the bank, the robbers locked three employees and two customers in the bank vault after confiscating the money. 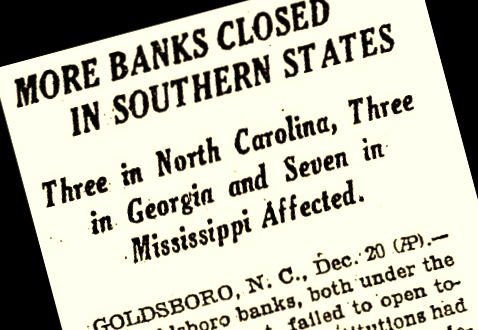 Funds at the bank were insured by Fireman’s Insurance Company, and the stolen loot has already been replaced, according to bank president Lawson Fountain. “Two black men entered the bank together, one was six feet tall, weighing about 180 pounds, looked to be between 20 and 25 years of age. He was wearing a tan shirt, flared, tight brown pants. He wore his hair in an Afro style and had a moustache. “The other robber who was holding a snub-nosed pistol, was about five feet six inches tall, wore a purple shirt, and also wore his hair Afro style. He did not speak very much during the time they were in the bank. “The tall robber came to my teller cage and asked to have two $20.00 bills changed for forty ones. Then the short fellow came in behind me with his pistol drawn. “I then emptied my cash drawer into the pillow case and at that time he motioned for me to go to the vault, and pulled the vault door open. He emptied the safe of 500 one dollar bills, crammed it into his pillow case and proceeded to empty John Robinson’s personal cash bag from the vault. “After opening a new package of shoe strings, the robber tied my hands behind my back, told me to sit on the floor of the vault and tied my feet together. “Mrs. Marilyn Blyler, another teller, returned from the post office and the pair tied her up and closed the vault door. “At this time a customer John Brantley and his son Walter entered the bank building, and they were herded into the vault and were quickly followed by Jimmy Fountain, son of President Lawson Fountain. Vault prisoners were concerned for the health of Mr. Brantley, who was reported to be in poor health, but he calmed the others by telling them, “It won’t be long before someone comes, because our wives are outside. Mrs. Brantley came into the office, did not say anything but coughed. Mr. Brantley said “That’s Hazel, and called to her, reported the bank had been robbed and that he and other employees were locked in the vault, and asked her to get the police. Jackie Giddens came into the bank and Mrs. Bueger told him how to unlock the vault and within thirty minutes from their lock-in they were all free and breathing a sigh of relief. The five by five foot concrete and steel vault posed no immediate danger, but could have been disastrous if it had not been opened in a short time. Witnesses all say they had never seen either of the men before, but from accents they were believed to have been from the North. Both were calm, cool, and collected, indicating they were professionals.